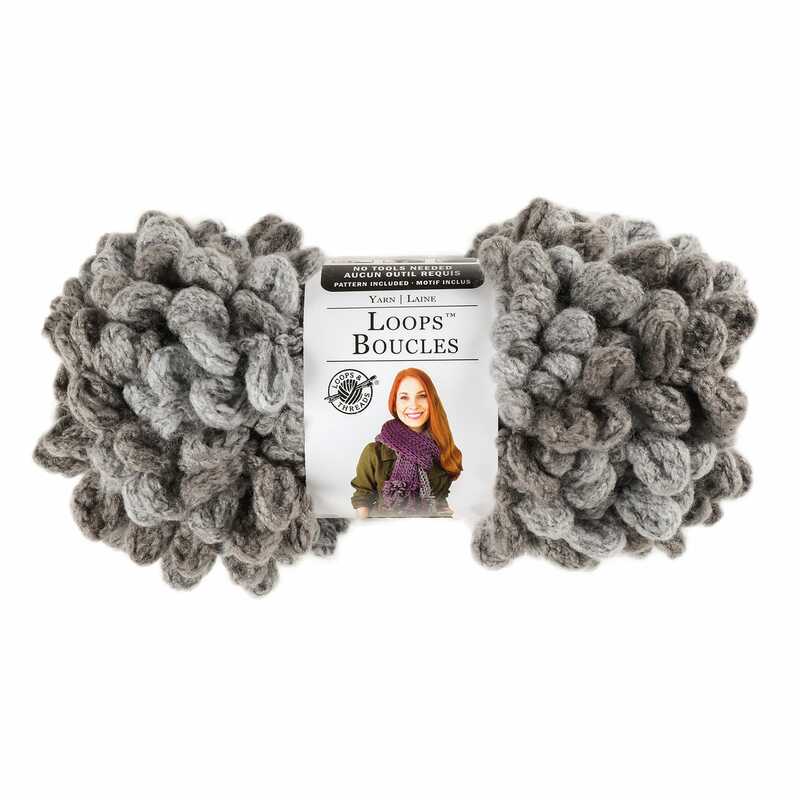 A new type of yarn has appeared in stores, loop yarn. As the name suggests, loop yarn is made up of lots of preformed loops and does not require knitting needles to use. All you need to knit are your hands. 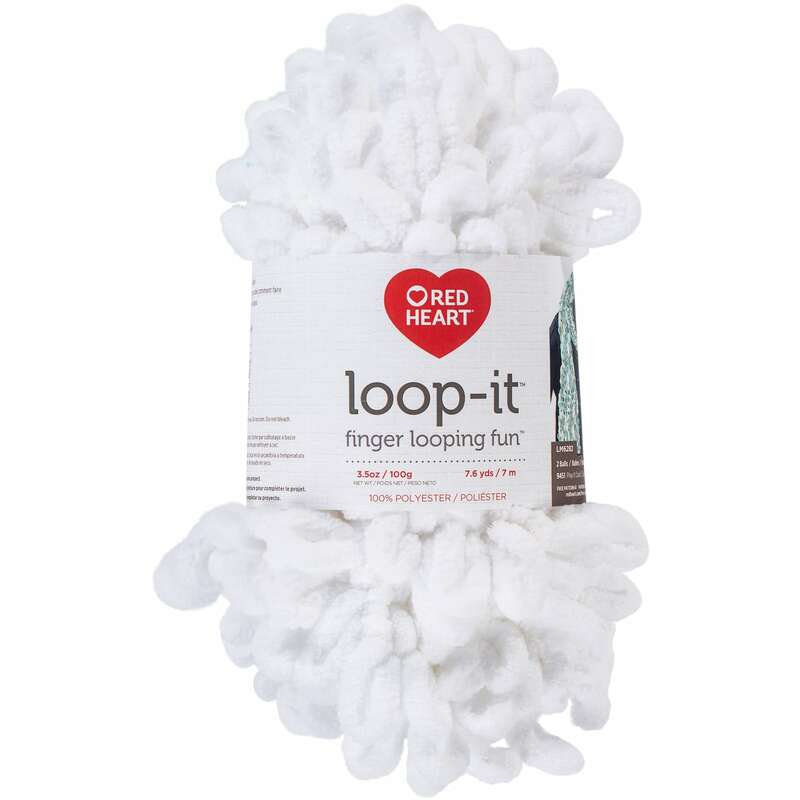 A number of manufacturers are making this loop yarn - Bernat Alize Blanket EZ yarn, Big Twist Loopity Loop Yarn, Red Hearts Loop-It Yarn and Lion Brand Off The Hook Yarn. 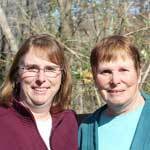 Links to purchase yarn are at the end of this article. Needlepointers.com has a series of loop yarn tutorials and project ideas which will show you how to use loop yarn and give you project ideas. 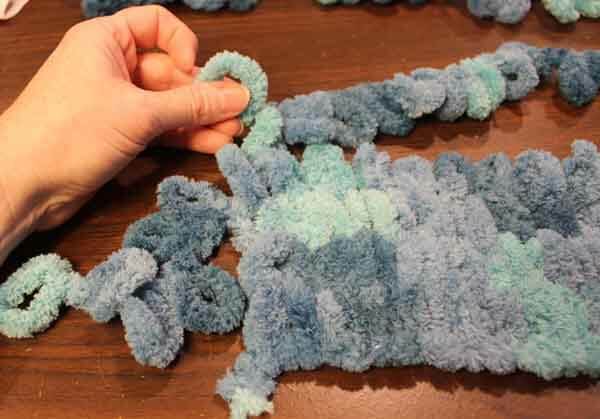 This loop yarn tutorial is on how to add a new skein of yarn. When you run out of yarn or you want to change colors, you need to add a new skein of yarn. 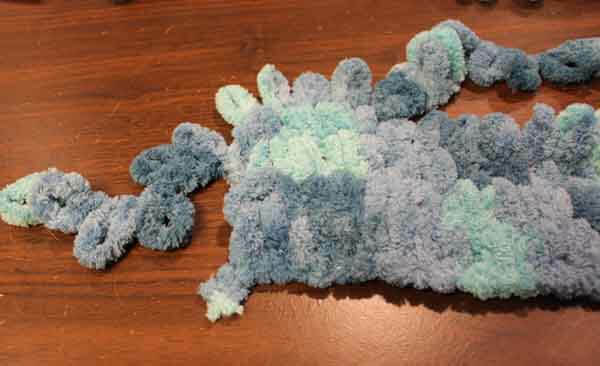 Watch this video and read the following photographic instructions to learn how to add a new skein of yarn. 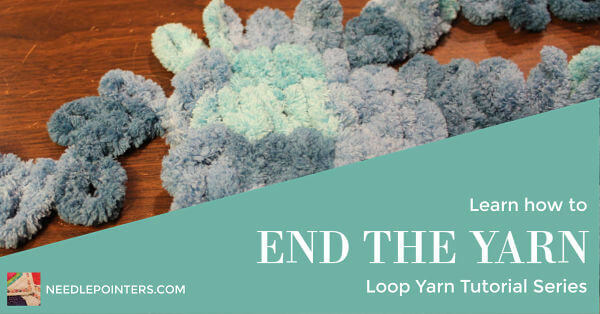 Watch our Video Below or Click the link to watch Loop Yarn Ending Yarn Tutorial in Youtube. Most techniques with this looped yarn is easy, but attaching a new skein of this looped yarn is super easy. 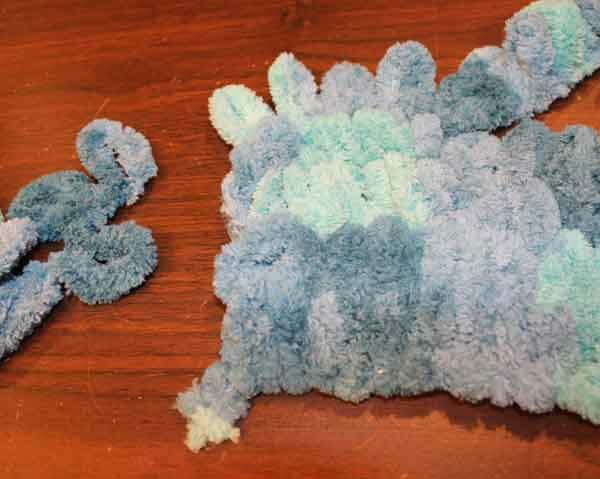 When you run out of yarn, or need to change a color, follow these steps. At the end of a row, simply insert the first loop of the new skein into the last loop of your row. Then continue knitting the row as before. You can also start new yarn in the middle of the row. In this case, be sure to loop the first/second loop of the new yarn into the same loops as the last two loops of the ending yarn. In this case, you will have two loops in one position. Be sure to pick up both loops as one when you stitch back across the next row. You would not want to end up with extra loops! To remove the tails, simply cut them off with a scissor making sure not to cut the loops. The following photo shows how project looks after removing the tails. 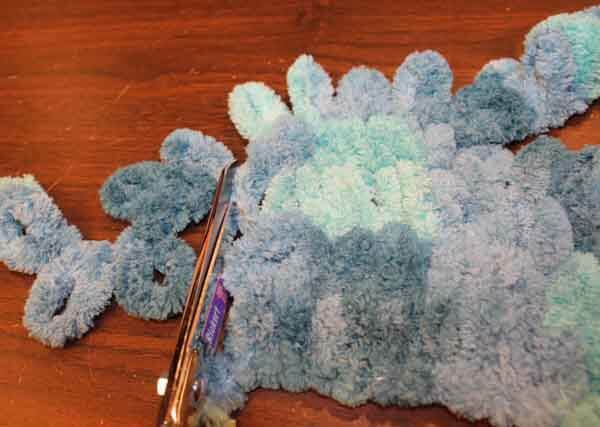 NOTE: Some tutorials say to weave the tail into the project, but I found this is not necessary as long as you are careful when cutting the tail. The Stocking and Garter Stitches are the main stitches used for stitching with the looped yarn. Watch our tutorials by clicking the links below and learn about each of these stitches. 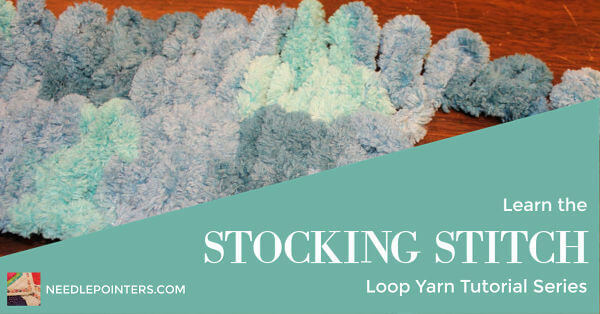 Loop Yarn Tutorial - Learn the Stocking Stitch (Stockinette Stitch) - Learn to make the stocking stitch with our video and photo tutorial. 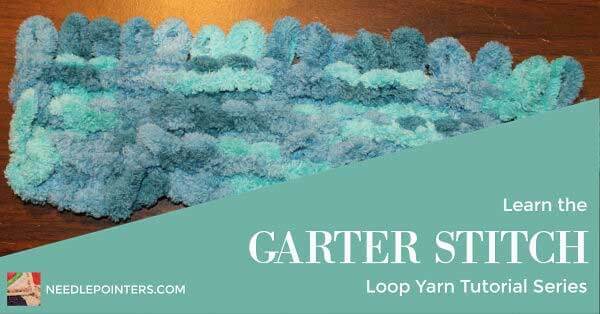 Loop Yarn Garter Stitch Tutorial Our Loop Yarn Garter Stitch tutorial will show you how to make the garter stitch which is the companion stitch to the stocking stitch explained in this video.